William Graham Scroggie, a prolific writer, was a gifted, intellectual, and deeply spiritual man, raised up by God for the edification and encouragement of the church. Subsequently, he held pastorates in Bethesda for ten years, and seventeen years in Edinburgh, with two years of ministry in New Zealand, Australia, the United States, and Canada. He then spent seven years at Spurgeon’s Metropolitan Tabernacle in London. During WWII, bombs destroyed his home three times, and the “church” building was burned down. Ill health forced his retirement from active preaching in 1944, and the remaining years were devoted to writing “The Unfolding Drama of Redemption.” He died in 1958. Originally in three volumes, the book is now one. It contains 230 charts and illustrations, 37 maps and diagrams, and 176 study outlines. It is easy to read as to its vocabulary and diction, and yet detailed and particular in its explanations. This book presents an overview of the whole Bible in demonstrating God’s plan of redemption for the human race, and the accomplishment of the same, from the first verse of Genesis to the last verse of Revelation. Human history is likened to a drama, not a theatrical production. Action is common to both, but in the former, it is real, while in the latter it is feigned. Using the author’s words: “This view we speak of as synthetical, to distinguish it from analytical. By synthetic Bible study is meant, that method whereby the various parts are viewed together, are seen in their relation to one another, and are regarded as constituting a whole.” But, while a panorama, it gives a detailed explanation of each of the 66 books making up the whole, showing their contribution to this redemption theme. Included are explanations of events and secular situations of the times in which a writer wrote his prophecy, book, or epistle to account for statements that are made. The various Bible books are analyzed and broken into divisions and sub-divisions to enable the reader to grasp the purpose and content of each. There are generous quotes from other recognized teachers and authors of a previous day. And throughout this book, Mr. Scroggie emphasizes that the Lord Jesus Christ is the sum and substance of the whole of Bible revelation. This book is doctrinally sound, is thoroughly organized, and is a must for every young Christian. It also confirms to faith the reliability of the Bible in showing that such detailed examination and analysis of it under critical scholarship, is evidence that there is an answer to even the difficult passages that skeptics love to dissect. Every Bible student first needs a lexicon or aid to understand Scripture word meanings; that is, to explain or amplify the meaning of a word as it has been translated from the original languages. But after that, if I had only $50.00 to spend on a help to know God’s Word better, “The Unfolding Drama of Redemption” would be my first choice. 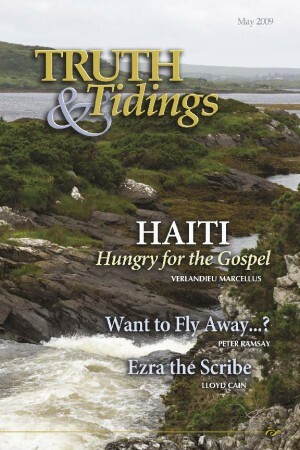 It is published by Kregel and available through Gospel Folio Press.